The protagonist/antihero. 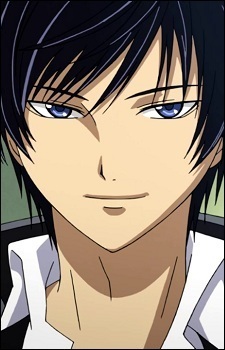 Ogami Rei is a mysterious young boy about whom not much is known. Sakura first witnesses him burning people with a blue flame in a park; the day later he transfers to her school. When Sakura confronts him about his killings, Ogami reveals to her that he's in fact a "Code:Breaker", a secret government agent who punishes those who can't be punish by the law. His code number is 06, meaning he's the weakest member of the Code:Breakers. He believes strongly in the idea behind the Code of Hammurabi, often citing the quote "Eye for eye (目には目を, Me ni wa me wo? ), Tooth for tooth (歯には歯を, Ha ni wa ha wo?)" and adding on "EVIL for EVIL (悪には悪を, Aku ni wa aku wo?) Externally, Ogami is an aloof, uncaring person who is whole-heartedly dedicated to punishing evils and cares for not much else, but Sakura gets closer to him she realizes that his actions often belies his cruel words. Ogami's power lies in his left arm, which burns anything he touches with a blue flame. It's later revealed that this blue flame is only a part of a set of seven flames, named after seven demons, which are said to "incinerate the seven deadly sins". In return for these powers, Ogami has to give up something as compensation. So far, the revealed flames are: - Blue flame - Satan - the flame Ogami uses most often. It can incinerates everything Ogami touches. Ogami sacrifices his sense of taste for the use of this flame. - Black flame - Belphegor a.k.a the blaze of limbo - a flame which can burn any special power "tainted with the seven deadly sins". The Code:Emperor takes the power of "Sound" Yuuki partly transfers to Ogami as payment for this flame. When Ogami overexerted his special power, his Lost form results in a severe cold. However, it's later revealed that Ogami's true Lost form is invisibility.